Is it "enlightened" to reject the desire for countries to protect their cultural property and archaeological sites? Does it matter in our cosmopolitan world if an Attic krater is displayed in Minneapolis or Rome? Or an Athenian marble relief in London or Athens? Or a Cycladic figure in Paris or the Naxos Museum? But should museums acquire recently surfaced antiquities? And this brings me back to my series of questions, and which is why at another level I would have to answer, "yes, it does matter where objects are displayed". Take the massive rise in the number of previously unknown Apulian pots available at auction through the 1980s and 1990s. Their appearance is directly linked to the deliberate destruction of funerary contexts in southern Italy to supply a market. And the buyers have been public institutions and private collectors. So it does matter if there is active acquisition of Apulian pots because there is a material implication for the funerary record (see "An Italian Cavalryman in Manhattan") and an intellectual implication for their interpretation. Discouraging the acquisition of Apulian pottery unknown prior to 1970 is one way to discourage looting. 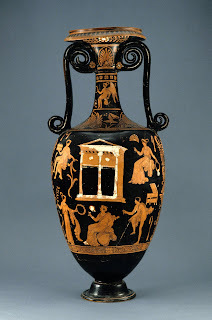 The pieces of Apulian pottery attributed to the Darius painter and returned to Italy from Boston, Malibu, Princeton, as well as New York, have lost their contexts; but their transfer of ownership will probably make those museums think twice about acquiring newly surfaced Apulian material. Cuno would, no doubt, argue that the contexts had been lost: so does acquisition matter? But when we realise that these returning Apulian pieces are associated with individuals and galleries such as Giacomo Medici, Fritz Bürki, Robert Hecht, and Atlantis Antiquities, it can be appreciated that these are unlikely to be chance finds. And I am left thinking that the "Enlightenment principles on which public museums in the United States were established" have perhaps contributed to the irreversible destruction of our universal, or cosmopolitan, cultural heritage. Cuno, J. 2005. "Museums, antiquities, cultural property, and the US legal framework for making acquisitions." In Who owns the past? Cultural policy, cultural property, and the law, edited by K. Fitz Gibbon, pp. 143-57. New Brunswick: Rutgers University Press / American Council for Cultural Policy.